Press Release (ePRNews.com) - ST. LOUIS - Jun 19, 2017 - Long-time St. Louis housing leader C.F. 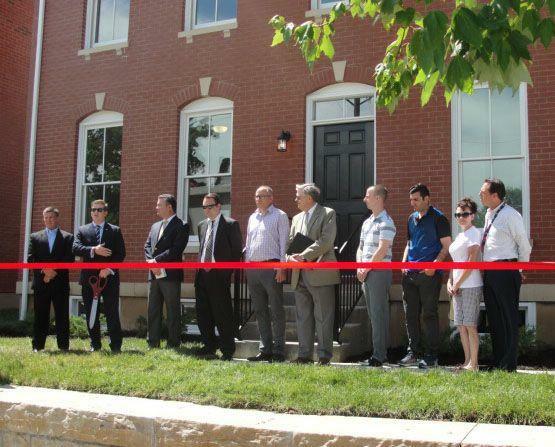 Vatterott celebrated a ribbon-cutting for the completion of five new Energy-Star rated homes at Charless Village in the city of St. Louis on the site of the historic Charless school at 2212 – 2230 Shenandoah Avenue, six blocks south of Interstate 44 in the City’s 7th Ward. The new-construction homes are the first to be built in near-southside McKinley Heights in over 25 years. Four of the five homes are already sold with the first two new home owners scheduled to move in this month. The homes have brick elevations historically consistent with the neighborhood, while at the same time featuring modern open floor plans, hardwood flooring, granite counters, period trim and millwork, full basements, two-car garages and high-efficiency systems as well as 9-foot ceilings on both the first and second floors. In addition, buyers of these homes will benefit from tax abatement, further increasing their affordability. Two of the five homes even feature main floor master suites – something quite rare in the city. The ground was formerly the site of the Charless Elementary School, built in 1895, and which was torn down in the late 1980s prior to when Vatterott purchased the property. This site is also ultra-convenient, with easy access to Soulard, Downtown, and the rest of the metropolitan area via Interstate 44/I-55 access a half- mile away, and is within one mile of three city parks. Also a block away from these homes is McKinley Heights Classical Leadership Academy, one of the premier Magnet Schools, located at 2156 Russell Blvd., reachable by a short walk up Missouri Avenue, a quiet residential street. Funding for construction of the new homes has been provided in part by the St. Louis Community Development Agency (CDA) and utilizes Missouri Neighborhood Preservation Act tax credits to make these homes even more affordable. To visit Charless Village take Jefferson Avenue south of I-44 to east on Shenandoah Avenue two blocks. Floor plans and details are available online at www.VatterottHomes.com. Sales are being conducted from C.F. Vatterott’s South City sales office at 3832 Blow Street in the builder’s Boulevard Heights new-home community. The office is open daily 10 a.m. to 5 p.m. and staffed by sales representative Stirling Presson, 314-351-6700 (office), 618-910-9410 (cell), or spresson@cfvatterott.com. C.F. Vatterott holds a premier place among St. Louis home builders. Established in 1919 by Charles F. Vatterott Jr., the company is one of the oldest and most recognized names in the community, offering new homes of superior quality in many areas of Greater St. Louis including the City of St. Louis, St. Charles County, Jefferson County and St. Clair County in Illinois.